Home » Email vendor Selection Articles » Report: Do marketers get the service they need from their Email Marketing Service Providers? Are email marketers getting the level of service they need for their brand’s email channel? 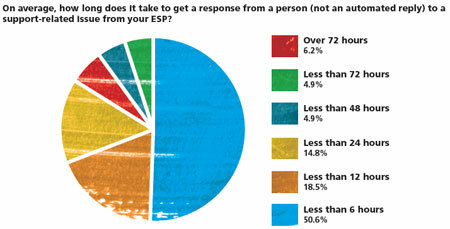 That is the main question answered in the 2012 retail email marketer survey by Bluehornet. In other words: Are email marketers getting the level of service they need for good business? “Service” is a broadly used term in the email marketing industry. All the email software companies that are listed on our site can be called email Service providers. Even if their service purely consists of delivering (large volumes of) commercial email for marketers. Some marketers only use the email software and the email marketing tools to create, segment, send, and track their email campaigns. The software itself could be seen as a service. (SaaS). For this report Bluehornet surveyed all retail email marketers at the IRCE show in Chicago. These retailers currently work with an email service provider. The research was aimed at knowing more about the value of full service to them. Plus what the relationship between the email marketer and their Email service providers means. 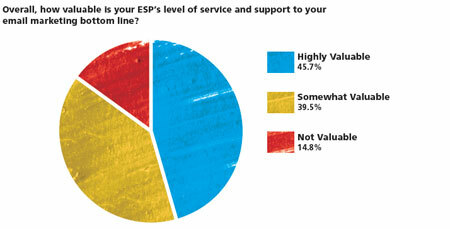 Less than half of the 78 retail email marketers surveyed, indicated that the level of service of their current ESP was highly valuable to their email program’s bottom line. 39,5% found it somewhat valuable. What do those numbers mean? Some of the retail email marketers are not using the services of their Email Service Provider. So that might explain a part of the lower / none added value. For various reasons another part of the marketers are seeking the value they are not gettting somewhere else or doing all emailings in-house. But if we take a look at the response time of account managers you might get a different idea where the lower ratings might also come from. There is a difference between Self-service email marketing software and the added services that full service email marketing providers offer. Often email marketing teams are small and in many cases it even is a one man show. With the online marketers’ attention being divided across many channels marketers increasingly have to rely on the help from their email marketing agency or ESP to get things done. So it’s an important question to ask. What does the “service” part really mean to the marketers driving their brand’s email program? Response time is often an indicator of the level of service an email marketing agency or Email Service provider is offering. If you ever had an immediate issue (problems with sending, etc. ), you know that issues are best solved quickly. It is truly frustrating if you can’t reach anyone from supplier side it there is an issue . The survey asked how long it takes to get a response from a person (not an automated reply) to a support-related issue. Seen in a context of an Average response time, I find these numbers to be quite shocking. For the marketers who give newsletters and email campaigns priority, the best advice would be to take a good look at their Service level agreement (SLA). Find an email newsletter provider that can match the value they would like to get. And promote pro-active action from the side of the ESP. If you want to know upfront, how full the full service actually is, try number 3 and 4 from these tactics to evaluate an email service provider.